All timber harvesting companies are not equal – so what are the qualities that might make you choose BW Timber Harvesting over other timber harvesters serving New Hampshire and Vermont? Here are some compelling reasons why you should make BW Timber Harvesting your go-to timber management solution in Vermont and New Hampshire. You don’t become a major provider of timber harvesting services throughout two states without establishing a solid reputation for quality that inspires trust. BW Timber Harvesting not only succeeded in riding out the Great Recession – we actually managed to thrive during that period due to our prudent business decisions and our commitment to the highest levels of service, professionalism, integrity and transparency. Our full range of services makes us a versatile all-in-one solution provider for timber harvesting, standing timber appraisals, lump sum timber purchases and other timber harvesting and forest management services. BW Timber Harvesting is also committed to a zero-waste approach regarding harvested timber. No matter what part of the tree, all harvested timber is an asset. We keep current with the timber market and use our resources to find buyers for your timber- all of it. Even “junk trees” can have significant industrial and commercial value, whether they’re processed into wood chips or burned as fuel. Our ability to find a market for 100% percent of the timber we cut allows you to enjoy maximum profit while respecting the environment. We have a zero waste approach. We maximize your profit by finding a market for 100% of your timber. Some companies don’t understand, or care, that harvesting trees and managing forested land has a major impact on the environment – an impact that can be either positive or negative, depending on the skill, awareness and responsibility of the provider. Here at BW Timber Harvesting, we don’t just clear away trees. We employ careful, well-considered strategies to create a healthier space for the more desirable trees on your lot or in your forest, encouraging optimal growth at a sustainable rate. Our expertise at view management can also greatly increase the attractiveness – and value– of your property in the eyes of others, including potential buyers. 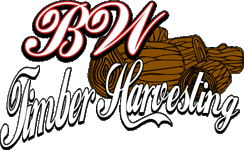 Once you’ve learned more about BW Timber Harvesting’s unique qualities, you’ll wonder why you even considered taking your timber harvesting needs to anyone else. Contact our company today!